Amazing, creative psychic disciplines with meaningful options - for just $1.50! The second pdf of disciplines for Porphyra clocks in at 9 pages, 1 page front cover, 3 pages of SRD, leaving us with 5 pages of content. It should be noted that the pdf is laid out for digest-size (A5/6’’ by 9’’) – you can fit up to 4 pages on a given sheet of paper, should you choose to do so. Most of the psychic disciplines herein employ Charisma as governing attribute for the phrenic pool – as such, I’ll explicitly note the two disciplines that use Wisdom instead. The first of the disciplines would be Dance, which covers, bonus spell-wise, the gamut from feather fall to overwhelming presence. It nets Perform (dance) as a class skill and ½ psychic level, minimum 1, as a bonus to he skill-checks. Amazing: You can make an immediate action check to dance to fortify allies against sight-based magical effects. Starting at 5th level, you may substitute Perform (dance) for Acrobatics and Fly and 13th level lets you replace thought and emotion components with the somatic component of dancing, but at the downside of potentially incurring spell failure. Meaningful, creative and cool ways to influence the gameplay – huge kudos! The second discipline would be fear, beginning, unsurprisingly, with cause fear and offering cruel jaunt and the like later. The focus of this discipline is cool: You are still affected by fear, but it hampers you less – really cool: You can elect to be affected by effects causing the shaken condition and instead of the condition’s normal effects, even gain a buff – cool tweak on the condition and, once again, a meaningful way to customize the character – particularly for darker, grittier games this one can be cool for a player who wants a character that is not impervious to fear, but who learns to harness its powers. The heroism discipline nets you proficiency with 2 martial weapons, or one exotic weapon of Improved Unarmed Strike and makes the psychic basically a Way of Life practitioner (see PDG’s underappreciated, nice martial arts sourcebook “Unarmored and Dangerous”) – but fret not: The relevant rules are provided herein – you don’t need that book to use the discipline. Higher levels yield Uncanny dodge and its improved brother. Once again, meaningful tweak, with spells ranging from mage armor to deflection and heroic invocation. 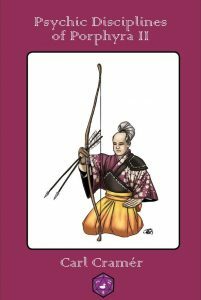 Kyudo would be governed by Wisdom and focuses, unsurprisingly, if your Japanese is up to snuff, on archery and precision, netting Precise Shot, proficiencies, starting equipment and a cool mechanic: Scoring critical hits against targets with bows replenishes 1 point of your phrenic pool. Better yet: The ability can’t be kitten’d due to a HD-cap – kudos!! You may also replace thought or emotion components with focus or somatic components while wielding the bow. Spells with a range that is not touch or personal, nor has a cone-shaped AoE may be delivered in the form of ghostly arrows, using the bow’s range increment instead and starting at 13th level, the discipline allows for the replacement of both thought and emotion components. Once again, really, really cool! Mascot nets you a familiar or animal companion (Improved Familiar may not be taken) and sports, spell-wise, the usual array of animal-themed spells, from speak with animals to animal shapes, with e.g. planar refuge included as well. However, to prepare spells, the discipline requires touching the mascot. 5th level yields a Will-save bonus when sharing a space with the mascot and 13th level allows for the sharing of the mascot’s evasive abilities. Perhaps that’s the otaku in me talking, but while this one isn’t mechanically brilliant, it does make me recall some anime I really enjoyed…I can see that one being the default caster role in some campaigns. The final discipline, Void, is once again based on Wisdom and would be the second discipline centered around the concept of a psychic with moderate capabilities in WuXia-like contexts – with spells like anticipate peril, transformation, mind blank and akashic form, it certainly works that way. Particularly since it provides the second tie-in with “Unarmored and Dangerous” – the psychic using this discipline is a Way of the Void practitioner. Once again, the full rules required are presented herein. Higher levels yield evasion and its improved version, respectively. The pdf sports a bonus pdf penned by Mark Gedak, where we get, on the two pages of content, Sirani the Favored, a level 1 (CR 1/2 ) dhosari paladin. Nice bonus! Editing and formatting are top-notch: Apart from one instance where the size category “Small” was lower case’d, I noticed no hiccups – and that one is cosmetic. Layout adheres to Purple Duck Games’ printer-friendly 1-column standard with purple highlights. The pdf and bonus pdf sport no artworks apart from the cover, but at this price, that’s totally fine with me. Amazing: The pdf comes fully bookmarked, in spite of its brevity. BIG kudos! Carl Cramér second foray into psychic disciplines lacks all my criticisms of the first one: Each discipline herein is meticulously precise, offers a strong theme for both role- and roll-playing and, more importantly and impressively, a meaningful change in how the psychic class operates. In short: This is a truly impressive little gem. Oh, and it costs a ridiculously low $1.50. Seriously, I have read a lot pdfs with 20 times the word count and less cool ideas. Oh, and yes, if you’re looking for a way to make the psychic fit into an Asian context – well, then this should be considered to be a must-buy. Even if the Asian flavor of some disciplines doesn’t do it for you, they’re one name-change away from fitting into pretty much any setting. Inexpensive, creative, precise – 5 stars + seal of approval. Get this. You can get this cool, inexpensive pdf here on OBS! You can support Purple Duck Games making cool options like this here on patreon!